Haben Girma enjoys doing things that are considered unthinkable. She was born deafblind in California in 1988; her mother, Saba Gebreyesus, fled war-torn Eriitea in winter 1983. * They resettled in California. Girma’s brother Mussie Gebre, six years older, also born deafblind in Eritrea, had already experienced exclusion. There were schools for the deaf and schools for the blind, but no opportunities for deafblind students there. In the U.S., they were guaranteed access to education by IDEA, and there were also Section 504 and the ADA. Attending mainstream public schools in Oakland, Girma, a superb student, left her classes for an hour each day to learn Braiile; she benefited from teachers who set high expectations, inclusive communities, and civil-rights laws. She also had accessible technology, such as a digital Braille device, something that Gebre didn’t have access to in Eritrea. But he finally started his own education at age 12, learned English, Braille, and ASL (Girma signs too), and now travels throughout California, teaching disabled people how to use technology that benefits them. At Lewis & Clark College (Portland, Oregon), Girma achieved a civil-rights breakthrough in the cafeteria. Without access to the daily menu, she was tired of accepting whatever was put on her plate at the sequential food stations. The food-service manager agreed to E-mail her the daily menu, which she could print on her Braille reader. But this happened only occasionally. The food-service staffers were “too busy” to do it regularly. After mulling it over, she told the cafeteria managers that they were obligated to make “reasonable accommodations” under the ADA. They complied. And the following year, a blind student enrolled at Lewis & Clark, and benefited from Girma’s assertion of her rights. Working to increase access to digital technology for people with disabilities, she helped achieve victory in National Federation of the Blind v. Scrbd, (2015), one of only two decisions—so far—to hold that the ADA applies to virtual businesses. On July 20, 2015 during the White House celebration of the 25th anniversary of the signing of the ADA, she met with US President Barack Obama to highlight the importance of accessible technology. 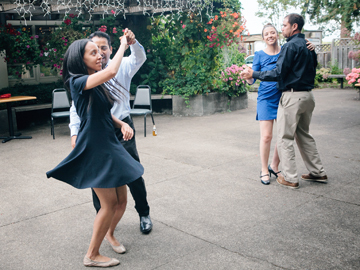 Known for her fearless spirit, Girma is a skilled dancer (having learned salsa from a blind dancer, she participated in Harvard Black Law Students Association Harvard Ballroom Dance Team), and has learned how to tandem surf. Other accomplishments, we’re sure, are in the doing. * Eritrea is a country in eastern Africa, on the Red Sea coast, bordered by Sudan in the east, Ethiopia in the south, and Djibouti in the southeast. A multi-ethnic, multi-religious nation, it has been under Italian, British, and Ethiopian control, gaining independence in 1963. No national elections have been held since 1993; the country has been plagued by political repression and unrest. It’s a totalitarian state; only one party holds power. Its government has been repeatedly accused of numerous human-rights violations. † The Skadden Fellowship Foundation, founded in 1988, sponsors law-school graduates who plan to practice public-interest law. It's been called “a legal Peace Corps.” Fellows work with a sponsoring organization to provide legal services to poor, elderly, homeless, disabled, and disenfranchised people. They are paid a full salary and fringe benefits. Claudia Gordon was a Skadden Fellow at the NAD Law Center fro 2000 to 2002.